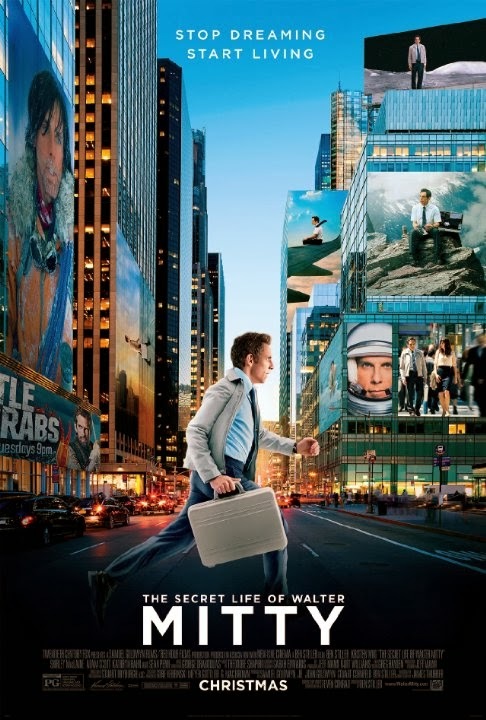 This movie title is quite apt - "SECRET" life of Walter Mitty. I am pretty sure 80% of you all don't even know about this movie, because I didn't either.. Until I was browsing through Golden Village website for movies to watch and saw BEN STILLER! THE GUY THAT MADE DINOSAURS COME ALIVE IN NIGHT AT THE MUSEUM! If you have been stuck on what new year resolutions to make for 2014, this film will inspire you. TRUST ME. Why pay thousands of money on some "inspirational speakers" like Adam Khoo, when you can sit back, relax, laugh and be inspired ALL AT THE SAME TIME? "Stretchy man-toy: PLEASE! STAHP PULLING MY HANDS T.T"
Then he saw that this girl likes man who is ABC - Adventurous, Bold and Courageous, which is everything that he is NOT. So he can only daydream about being ABC. And we are given many awesome scenes of his imagination, which I assure you is SUPER FUNNY and cheesy. Until he finds out that he lost a photo that is supposed to be on the cover of the magazine that he is working in.. for the last time. The magazine is going e-version so BYE BYE printed versions. And the quest to find this missing photo is something ADVENTUROUS. At first, he holds back. But when he started to incorporate his pretty co-worker into his little fantasy zone-out time, THIS WALTER MITTY SURE IS MOTIVATED. What a horny guy, tsk tsk. The opening scene of the movie captures your attention even though Walter Mitty was doing something really frivolous - going on an e-Dating website. There was never a dull moment throughout the whole movie, either you are LAUGHING OUT LOUD at the hilarious and sometimes ridiculous scenes, or you are gasping at the beautiful landscape. No matter who you are, even when you are just an average person, there will ALWAYS be people who are out to make your life difficult, who discourages you from doing anything out of the ordinary, just like the transition boss of Walter Mitty. There will be people who will actively stop you from pursuing your own dreams, because they want to be better than you, or just so that they can feel good about themselves. Surround yourself with friends who encourages you to try out stuff, to step out of your comfort zone. Think about your current circle of friends, and think of a person who is always inspiring you, encouraging you. If you are weird like me, you will have friends who will always be critical and skeptical of the way you do things. Then, what separates these people from friends versus acquaintances is their feedback to you. Do they put you down, or do they point our your flaws and offer SUGGESTIONS TO IMPROVE ON THEM? Treasure these friends closely, because true friends motivate each other. In the case of Walter Mitty, his beacon of light was his pretty co-worker, whom because of her criteria of an ideal partner, becomes his motivational force to push him from DAYDREAM --> TAKING ACTION. When life offers you opportunities to LIVE LIFE, do it. And when life offers you an inspiration at $10, WATCH IT. Stay back for: No ending scenes, but do stay through the first credits for the amazing photos that they took for their film!